Looking for somebody who isn’t your average “cheesy wedding DJ”, and can understand why you want to hear Karnivool and early Faith No More at your wedding reception? Want somebody who actually specialises in alternative music, and doesnt just have a few greatest hits and compilation albums, but an entire collection of indie and alternative music to hand for your wedding (or birthday party)? 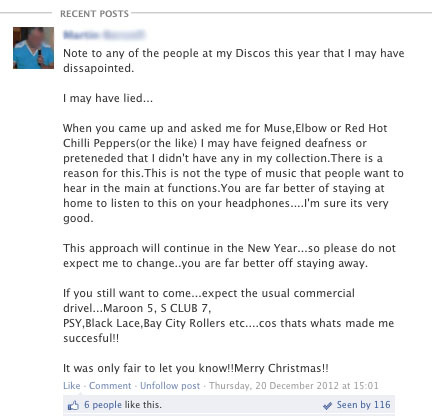 The following is a genuine post from a DJ on facebook. does it sound like the sort of gig you are wanting? 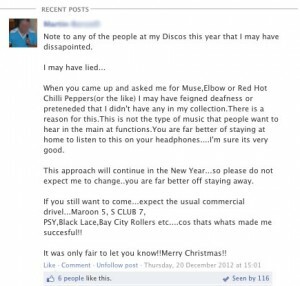 Note to any of the people at my Discos this year that I may have dissapointed.I may have lied…When you came up and asked me for Muse,Elbow or Red Hot Chilli Peppers(or the like) I may have feigned deafness or preteneded that I didn’t have any in my collection.There is a reason for this.This is not the type of music that people want to hear in the main at functions.You are far better of staying at home to listen to this on your headphones….I’m sure its very good.This approach will continue in the New Year…so please do not expect me to change..you are far better off staying away.If you still want to come…expect the usual commercial drivel…Maroon 5, S CLUB 7,PSY,Black Lace,Bay City Rollers etc….cos thats whats made me succesful! !It was only fair to let you know! !Merry Christmas!! If not, You’ve come to the right place. This site was set up after a few of us DJ’s realised there wasn’t really much out there for anybody who didn’t want to listen to David Guetta (or even worse, Black Lace!) on their special day, that when you ask for something “a bit more rock”, you don’t want the DJ to just pull out whatever rock single was in the top 40 recently (RATM springs to mind here) just to try and “keep the metalheads happy”. They don’t understand what you like, and won’t have most of the music you want to request on the night – yes you can request it all in advance, but what’s the point in that? altdj.co.uk comprises of a handful of experienced and professional club and event DJs who can play the sort of music you really want at your party. And if you require something even more exotic than even we can manage, chances are we know another DJ who CAN help you out. And yes, we have access to good quality PA and lighting equipment, just because we mostly DJ at clubs, doesn’t mean we don’t own our own kit and just turn up with a laptop and plug into the house system (although this could be arranged if you are on a tight budget). All the kit is PAT tested regularly, and our DJs have sufficient Public Liability Insurance (PLI), which most venues require proof of before they are allowed to set foot inside the venue. Also, if you don’t mind a bit of Katy Perry mixed in with Belle and Sebastian or Feeder, we can quite happily accomodate your needs. Just let us know the boundaries of where we can and can’t go in the run up to your party. We understand that you might want to get your auntie up on the dancefloor too, so will play a nice bit of motown if thats the sort of thing you want as well.